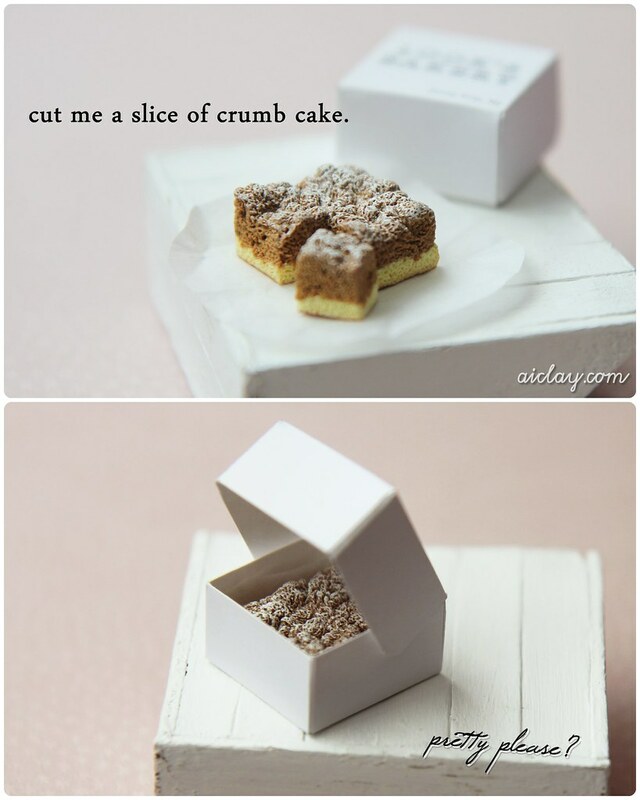 AiClay - a Haven of Miniature Food: Crumb cake is crumbly. A back story about this miniature crumb cake. It was commissioned by one of my most loyal customers, and this was modelled after the crumb cakes her late grandfather used to make. She also showed me some vintage photos of her grandparents' long-gone bakery and shared memories of her childhood. I especially love it when customers share their precious memories with me, and makes me work even harder at recreating the food miniatures for them. If you're not subscribed to AiMail or AiClay's facebook page, this would be the first time you're hearing this. AiClay team is expanding! Well, it used to be just me (and JY as advisor :)), so now I'm looking for more people to join in the fun and craziness! This is what I posted in facebook. A friendly, smiley elf wanted! I'll need you to help out in my miniature food workshops, mainly preparing and handing out materials/tools, and assisting the participants if they have questions. :) This is on an ad hoc basis. Most importantly, you have to be free on both 15th and 16th October! Besides these two days, I would also be conducting a personal training session for you (nth serious, it'll be fun and more like a free workshop for you!). If you're keen on being a Fellow Helper at AiClay's Workshops, please email me at buzz@aiclay.com with your full name, age and handphone number, and 'AiClay Fellow Helper' in the headline.